Eye on the Y: Why is BYU’s offensive line regressing? Quarterback change, quality of opponents have something to do with it. 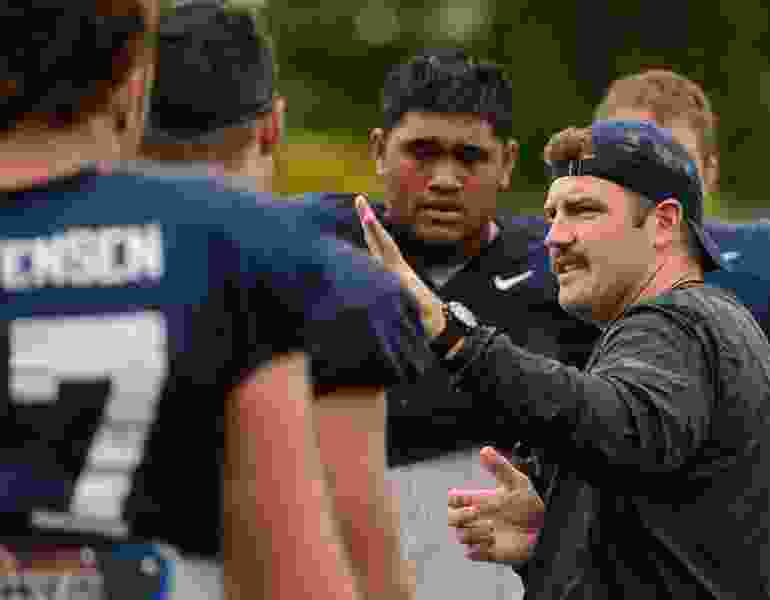 Moments after BYU stunned Wisconsin 24-21 at Camp Randall nearly two months ago, coach Kalani Sitake raved about the strides his program had taken in the weight room. He even awarded the game ball to the Cougars’ strength and conditioning staff and said their work building up the offensive line in particular was praiseworthy. Since then, however, the offensive line has seemingly regressed. The last two games have been especially troubling, as the unit gave up five sacks in the 7-6 loss to Northern Illinois and seven sacks in the 21-16 loss to Boise State. The Cougars were able to run for only 93 yards against the Huskies and 113 against the Broncos. Promising drives have been killed by holding penalties and false starts. Grimes and Pugh said the obvious difference is the quarterback change; Zach Wilson took over for Tanner Mangum three games ago, and the offense has changed in some ways to take advantage of Wilson’s strengths as a runner. The offensive line is adjusting to that. Also, the coaches credited Northern Illinois and Boise State for having outstanding defensive fronts that caused the Cougars some problems. Rest assured, Pugh said, the entire offense is working extra hard to get it figured out. Competition for the five starting spots is as heated as ever in practice. He declined to say if there will be any lineup changes for Saturday’s game against UMass (10 a.m. MST, BYUtv) at Gillette Stadium in Foxborough, Mass. • BYU golfer Peter Kuest is on fire. The junior from Fresno, Calif., won his third tournament of the fall season Wednesday, claiming the Saint Mary’s Invitational at Poppy Hills Golf Course on the Monterrey Peninsula. Kuest shot a record 61 (10-under par) in his first round and set the 54-hole record with a 13-under-par score of 300. The Cougars entered the final round in first place, but had a rough day and finished second in the team standings behind USC. • BYU’s undefeated women’s volleyball team is ranked No. 1 in the country for the ninth-straight week and remains the only undefeated team in the country. The Cougars play host to Santa Clara on Thursday and San Francisco on Saturday in their final regular-season home matches of the season. • BYU’s women’s soccer team won the West Coast Conference championship and earned the league’s automatic bid to the NCAA tournament. The Cougars travel to Fort Worth, Texas, on Friday to take on TCU at 5 p.m. MST. The Horned Frogs tied for third in the Big 12, but were awarded a host site by the NCAA.